In looking for a relaxing mountain respite, I had heard from distant family that in the mountains of Colorado exists a delightful little town called Breckenridge, home to gorgeous sunny trails and numerous winter slopes. Recently, I was able to make it into town for a few days and although I twisted my ankle hiking the nearby beautiful mountains, the rest of the experience was grand. One of the great benefits of the town was that they had local, good coffee. One spot in particular became my favorite, a 2nd floor cafe called Cuppa Joe located a little off the main street but within easy walking distance of almost everything. The coffeehouse had a few seats outside on their porch but inside existed plenty of room, with a well-arranged assortment of furniture, local art and pleasant lighting. As for the joe, they serve Novo Coffee out of Denver. After conversing with the barista, she recommended the Guatemala La Providencia via Chemex and I also ordered an espresso of Espresso Novo. The chemex-ed Guatemalan proved sweet, with notes of pound cake, vanilla icing and pear, as well as a bit of cashew and beef broth; an overall delicious coffee with a medium body. The espresso, pulled short-to-medium with light brown crema, delivered a nice citrus zing, some vanilla, basil, cola, dark cocoa and rye, rounding out to be a slightly bright and thoroughly ambrosial infusion. Cuppa Joe proved to be a great, frequent stop in town, whether I was staying to enjoy the cafe or taking the coffee to go. 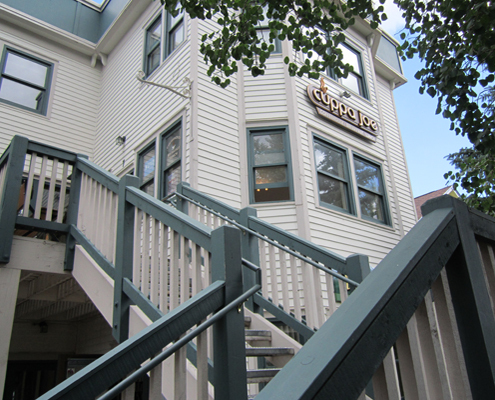 If you have the pleasure of visiting Breckenridge, stop by Cuppa Joe for a some great coffee. Place looks good. I feel to have a coffee by sitting in the outside porch. Thanks for sharing. Noted, thanks for sharing, it's got the coffee feeling all around. Cuppa Joe is one of my favourite places as well. I think all the people who have been there will indeed suggest Cuppa Joe as one of the best.